Waldorf is a German based synthesizer company with a twist. These mad men have always done things their own way, much to the delight of many a synthesizer afficionado. Known throughout the 90's for the Wave, the Micorwave, the Q, the Pulse and more, Waldorf has since introduced new classics for the new millennium, such as the Blofeld, the Rocket and the Streichfett. 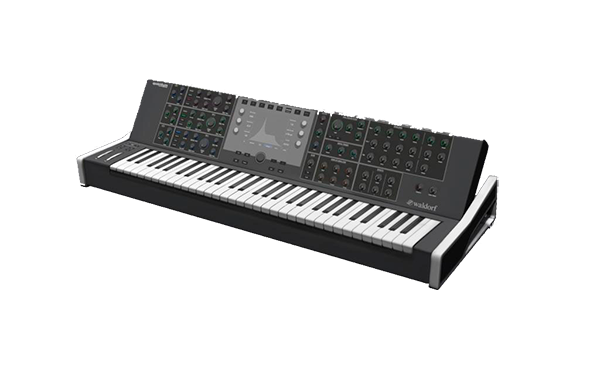 The company also offers a growing range of Virtual Instruments and effects like the Largo sythesizer and the Lector vocoder. Besides the 3-OSC, Dual Filter, 4 LFO, Matrix-controlled virtual-analog synthesis and the classic wavetables, the Blofeld now comes with a whopping 60 megabytes of sample memory (optional add-on for previous versions. Call us!). Just imagine adding a vocal-like noise spectrum to a typical Wavetable pad, spice-up a virtual-analog solo sound with a strong attack sample or just process any other sample with the countless oscillator and filter modulations. Play your sound creations on the high-quality keyboard with velocity and aftertouch. Pitchbend and modulation wheel are at your disposal and yes - there's even a sustain pedal input! All this loveliness is packaged in a sleek metal enclosure with a big graphic display, endless stainless steel rotaries and an internal power supply. And although it wears an unbeatable price tag, it is endowed with something very special. It comes... From Waldorf with Love! Although the User Interface is simple and easy to comprehend, it controls a rather complex sound engine which is capable of delivering rich and creamy pads unlike any other modern instrument. Twelve patches can be stored and selected in the Memory section, and both USB and MIDI sockets are of course on board. Few contemporary instruments offer electric pianists and keyboardists that elusive quality called soul. That's why Waldorf developed the Zarenbourg. Reduced to the essentials, this rare breed of instrument does one thing so well that it grows on the player, becoming an extension of body and mind. It has that magical touch of purism that all-in-one devices lack. No expense was spared in search of the ultimate in expression. And the look blends the hallmarks of classic designs with a more contemporary clean and cool vibe. It will look equally at home in the studio, on stage or in the living room. Simply power up, play, and possess instantly satisfying sound for player and audience alike. Its aluminum hood offers a sturdy perch for your other favorite instrument, and its integrated speaker system can render the piggybacked device’s signal. Let your laptop roost on this tower of power, and you can control plug-ins via USB and monitor the results via the Zarenbourg’s audio input. In short: If you've played the Zarenbourg once, you'll not be satisifed playing anything else. Go ahead. Prove us wrong. The flexibility emanating from Quantum's powerful oscillators and their interaction with one another is simply breath-taking. Never before has it ever been possible to create such a wide sonic bandwidth with one synthesizer. Ranging from classic analog, with precise sample playback, through to harsh or animated digital sounds, escalating all the way up to sound and sequence clusters, that can only be achieved with a modular synthesiser system. The carefully crafted array of aluminium knobs and encoders surround an ultra hi-resolution multi touch display. Waldorf engineers spent many long hours perfecting the interaction between the display and the physical control elements resulting in a highly flexible extension of the tactile experience. Each control knob is individually illuminated by a multi colour LED, making it instantly obvious when viewing complex settings and modulation settings, where related parameters can be adjusted quickly and efficiently. Quantum is so powerful it took the team into uncharted territory, involving both sound and the way it was felt the musician would interact with it. Quantum was designed and developed, manufactured and assembled in Germany, which allows for an unparalleled build quality.